I hope this finds each of you well and smiling. I have been hard at work pulling my fair share of the weight here at Casa de Perry and I have been awarded handsomely. First and foremost I want to thank all of you my adoring fan base. This week my numbers were in from my blogs and I am pleased to announce that over 5,800 people read about me from all over the world. There are too many to list but here are a few…China, Australia, Russia, Europe, Alaska, Fiji and on and on. Personally I think it is great that I, the one and only PERRY has invaded the world. To quote an 80’s icon, Madonna, “I want to rule the world.” It looks like I am on my way to doing it! 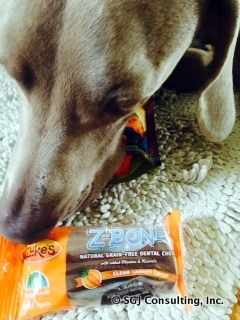 The best part of it all is that Auntie Mar-jor-ie sent me a care package full of most excellent treats from Zukes for my big 2 year old birthday and they are healthy and grain-free. I am totally addicted and have to be careful because my counter surfing has increased. I LOVE THEM! Mom especially likes them because they are healthy and support optimal health and nutrition. For all my canine fans out there you have to make your parentals get you some. I did have to go to the vet this week and get some shots but it was OK and I was a good boy. They were nice and I got some attention and treats, which are crucial to my existence. I did misbehave some today and stole pens and glasses a few times (I limit my thieving to those 2 items in the house) and was sent to the crate. Mom is hoping by my 3rd birthday I will learn to control my impulses to steal since I can’t seem to stop breaking the 8th commandment although I think I have the 9 other’s under control..except the one about coveting. I’m not sure I could ever get that one under control. So 8 out of 10 not bad, right? OK people I need to get going since Dad is not watching and I smell those Zukes treat…. ← It’s all about Birthdays this month! You can let your Mom and Dad know that your cousin Maggie is not that much better at 3.5 than at 2. Keep up the good work on staying a puppy.